Մայիսի 5-ի վաղ առավոտյան, երբ գեներալ Ուորենի 5-րդ դաշնային կորպուսը շարժվեց դեպի Պլանկ Ռոուդ, արևմուտքում երևաց Յուելի կորպուսը։ Գրանթը հասկացավ, թե ինչ կարող էր կատարվել, և խորհուրդ տվեց. ↑ 3,0 3,1 NPS; Rhea, p. 34, estimates 120,000 Union, 65,000 Confederate. ↑ 4,0 4,1 Young, p. 235. 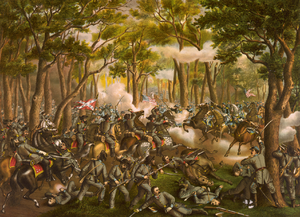 Although estimates of Union casualties are relatively consistent across sources, historians have presented significantly different figures for Confederate casualties. See the Aftermath section on casualties.